Louis drops by old pal John Tang’s new food stall in Yau Ma Tei to give his feedback. Making his debut in the nineties with Yesteryou, Yesterme, Yesteryear <記得…香蕉成熟時>, 42 year-old John Tang (鄧一君) has since left the entertainment circle for many years and made a successful switch to the insurance industry. 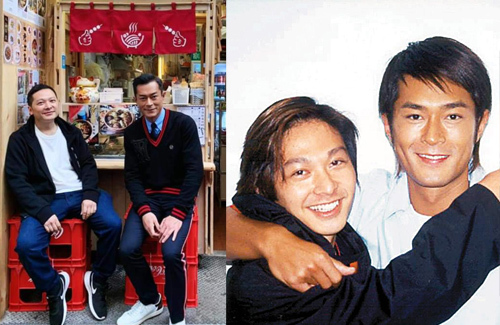 Recently, he invested $400,000 HKD in a food stall serving local Hong Kong-style cuisine, and had also informed good friend Louis Koo (古天樂) of the shop opening, to which Louis promised to make time and drop by. John had appeared in many classic TVB dramas such as A Recipe for the Heart <美味天王>, Burning Flame <烈火雄心>, Man’s Best Friend <寵物情緣> and Detective Investigation Files IV <刑事偵緝檔案IV>, and had collaborated with Louis on numerous occasions. In Burning Flame, John had played Louis’ developmentally delayed younger brother. In real life, the two had also become close as brothers, keeping in contact over the years even as Louis’ career took off and John changed career paths. On March 20, John posted a photo of Louis at his stall on social media – the superstar had kept his word and dropped by the stall personally to try out his old friend’s delicacies. Knowing Louis for over 10 years, John understood his tastes and knew that he loved fish balls, siu mai and other Hong Kong-style delights, so he promised to serve him his signature curry fish balls if Louis were to pay a visit to the stall. 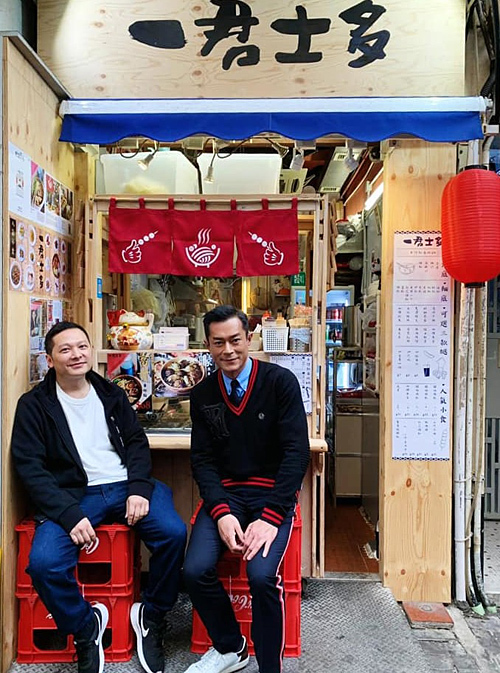 A month later, the former TVB actor shared a photo with Louis at his food stall, which seemed to indicate that Louis had gone down personally to try out his old pal’s cart noodles. Although appearing in various dramas in the nineties, John felt that his career in entertainment was unstable. He made the switch to join the insurance industry as a financial consultant after marrying his girlfriend in 2005. It was understood that Louis was the first customer to purchase an insurance plan from him back then. Being in the insurance profession for many years, John had achieved good results and is now a branch manager. Working hard to brush up professional knowledge related to insurance and management, he had also obtained a master’s degree. The more I read about Louis the more impressed I am. He had a terrible past, bad gossip and all but he grew up and by all accounts became a great man. Loyal friend and charitable person. Didn’t even know this actor left the industry. And he made good for himself. He looked so different now. @funnlim nice of Louis to help a friend. 10 min is really nothing, there is not much you can catch up with an old friend in that amount of time. But at least he got a nice promo photo with Louis for his business and a news article for his business PR. So nice of Louis! Competition was tough back then. It worked out for John to switch careers. I remember John, he had a cute charm. Louis is a good guy. It is impressive that his career and friendships are so strong.